Thank you for being a part of PALM Expo 2018! PALM Expo 2018 at the Bombay Exhibition Centre, Mumbai, was once again a resounding success. Celebrating 18 consecutive years, this edition of the show was the busiest ever. PALM Expo boasted the highest attendance and participation ever as a staggering 23,436 unique visitors, from across the country made their way to the venue from 31st May – 2nd June, 2018, demonstrating an increase of 20% from the previous edition. This edition of the PALM witnessed a significant increase in the share of trade visitors from B and C tier towns of India, with an increase in buyers from rest of India accounting for nearly 14%. The total exhibition area across the eight halls increased by 19.23% since 2017 and the demand for new products was reflected by the busy exhibit halls. A broad spectrum of products on display on the exhibit floors and the positive echo from the exhibitors and visitors alike, indicated that the international business atmosphere of PALM expo, India makes it a must-attend sourcing and networking platform. Thank you for making PALM 2018 a fabulous and successful event. We look forward to ushering in another fruitful edition in 2019. 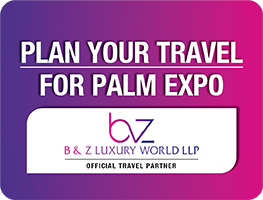 Block your dates as PALM Expo returns to BEC, Goregaon, Mumbai, 30.05 – 01.06.2019!